Tomasello Winery has crafted a collection of four seasonal wines to celebrate your seasonal moments. Each of these wines is made to capture the essence of the season. 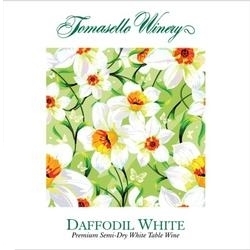 Daffodil White is a premium semi-dry white wine with hints of fruit. It is perfect served chilled with cilantro ladened salsas and as a dinner wine with citrus grilled chicken or shrimp fra-diablo. Daffodil White is the essence of Spring.